Congratulations to Shawn, Ashley and Abby for a safe but suspicious return home! Ashley had just returned from deployment to Afghanistan. We are thankful for her service to our country. 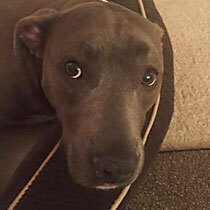 Alarmingly, earlier last week, Abby, her five year old pit bull went missing with no sightings. She did get a random text message stating that someone had her dog! However, despite repeated attempts to contact the person, they refused to respond! It was very strange. Dogs Finding Dogs did go out to track and the scent remained on the street. There was not much to find elsewhere, which seemed to indicate that she’d been picked up. We had our Private Investigator look into this matter. She worked her magic on getting more information on the name, address and other information from the random person who sent her the text message. They then sent a text to this person’s number, stating that the dog must be returned, and encouraged them to do the right thing, and to inform them that search dogs were now involved. Shortly after that text, Abby came waltzing in thru the doggy door as though she’d never left!. We will never know for sure if they brought her back or let her loose but we are so glad that Abby and Ashley are reunited at last.